Clustering Configuration: 2 servers using the same volume. Example Server application: Microsoft Enterprise Edition, MSCS (Microsoft Clustering Service), which offers Server/Application Clustering for Failover/Failback. With MSCS, one Server is designated as the active Server that has full access to the shared storage, while the other Server can see the volume but can not accessed to it until the active Server fails. Example Video Applications: CFS (Clustering File System, such as TigerSAN) is to be installed on each computer sharing the volume. 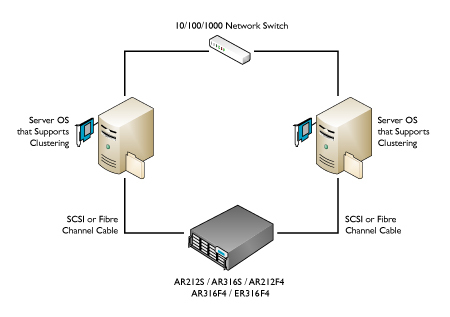 It automatically communicates in the background between each computer for the volume access operation over separate Local Area network (LAN), then the data is transferred over SAN or SCSI connection. In other words, the LAN is only used to exchange/pass metadata, the SAN/SCSI is actually used to access data on the Storage.